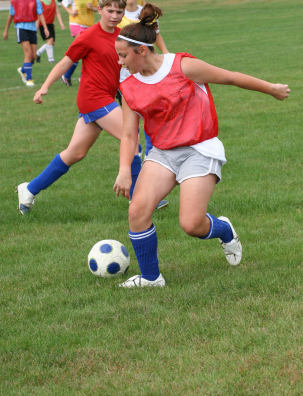 Soccer has a higher injury rate than many contact/collision sports such as field hockey, rugby, basketball, and football, with players younger than age 15 at higher relative injury risk compared with older players, concludes a clinical report in the February 2010 journal Pediatrics. Fatalities associated almost exclusively with traumatic contact with soccer goalposts . Heading does not support contention  that purposeful heading leads to either acute or cumulative brain damage. In one study, girls (11.9%) and boys' (11.4%) soccer had the highest rates of injuries as a direct result of an illegal activity as ruled by a referee or disciplinary committee, behind only girls' basketball (14%). Expert consensus that officials controlling the physicality of game and emphasis on safe play with respect for one's opponent can both play significant roles in reducing contact injuries. Anchor goalposts according to manufacturer and CPSC guidelines. Protective eyewear  recommended; should be mandatory for athletes with only 1 functional eye or past history of major eye surgery or trauma. Source: Kouteres C, Gregory A, & AAP Council for Sports Medicine and Fitness, Pediatrics 2010;125(2): 410-414.